Volunteer | The Fralin Museum of Art, U.Va. This year we celebrate the 30th anniversary of The Fralin Student Docents, one of the oldest volunteer university student docent programs in the country. Our Student Docents facilitate close-looking with original works of art, gain vital experience as museum educators, and serve the community by leading tours for thousands of area school children every year. New docents participate in a semester-long training course in dialogic teaching, public speaking, and education theory, and are given ample opportunity to practice these skills. Some knowledge of basic art history is helpful but not required. After the training semester, student docents attend weekly education meetings Fridays from 1-2pm. Docent education meetings vary semester to semester, but always include education specific to the art and exhibitions on view. The Student Docents are an official UVA student organization operating under the supervision of The Fralin’s education department. Interested students are encouraged to apply by the spring of their second year in order to have at least one full year as an active docent after completing the training course. Rising fourth years will only be accepted to the program if they are planning to stay on for graduate study. Applications are reviewed by the docent coordinator and a committee of student docents. Applications are now open for the Fall 2019 Docent Training Course. You can apply here. Students who wish to become volunteer docents can find more information by contacting the Docent Coordinator at 434-243-2050 or by email with questions. 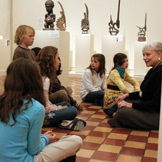 The Fralin community docents are trained in a variety of museum education techniques, including the inquiry method. After completion of the required Docent Training Course, they lead tours for school groups and community organizations and assist with the annual Writer's Eye competition and the Eyes on Art program for individuals with Alzheimer's. Community members who are accepted into the program are required to complete the Museum's 11-week Docent Training Course. 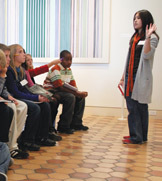 Participants in the course develop observational skills and knowledge of the elements of art through investigation of the Museum's collections and current exhibitions, and learn public speaking skills and techniques for facilitating tours. New docents complete a qualifying tour at the end of the course and commit to leading tours at The Fralin for at least two years following its completion. The Museum accepts applications on a rolling basis from community members who wish to become docents, and interviews are conducted prior to the beginning of each Docent Training Course. You can apply here. For information about future docent training opportunities, contact the Docent Coordinator at 434-243-2050 or email Docent Education.